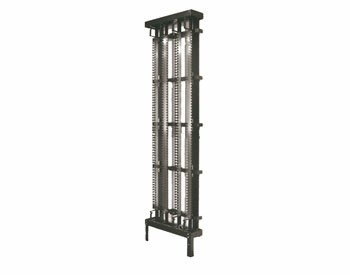 Modular frames that may be wall-mounted, or joined side-by-side or back-to-back. They accommodate 138 Krone, TUK or similar terminal blocks (types 237 and ABS) in two vertical rows, and are complete with cable management guides and jumper rings at the top, bottom and between rows, plus fixed fanning strips for individual blocks. Adjustable legs allow for uneven flooring, or may be removed where height is a limitation. Dimensions: Without legs - 1850(h)x 570(w)x 150(d)mm, with legs - 2010(h)mm. Weight 30kg.